There are dozens of Alaska issues that are complex and therefore of interest to sociologists. One of the most complex and downright complicated issue in Alaska concerns Pebble Mine. On the one hand, Pebble Mine promises to bring jobs and economic development to southwest Alaska, a region especially hard hit by the declining national economy. It promises to export tons of valuable minerals to the world market, making Pebble's partners extremely wealthy. The minerals in Pebble are sorely needed by several major industries. To develop the mine, the state and external partners will invest in much needed infrastructure--water systems, roads, airstrips, elaborate environmental monitoring and protection systems. On the other hand, the mine is located at the headwaters of two of the most salmon-rich rivers left in the world. 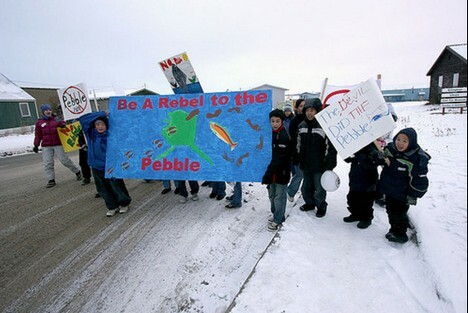 Pebble will be the largest open pit mine in the world, and will inevitably poison the land and waters. The probability of an environmental disaster that would wipe out the salmon and other wild food sources is high. Thousands of Alaska Native and other local communities depend on the salmon and clean water. Alaskans tend to be polarized on the issue, but many observers have only examined one side of the controversy and have ignored its complexitiy. There is a lot of debate about the environment, and natural resources, especially Pebble's impact on fisheries, but comparatively little about Pebble's impact on human communities. Here are some sites for you to examine so that you can become familiar with the issues. How would a structural functionalist analyze the issues surrounding Pebble Mine? How about a critical power conflict theorist? A symbolic interactionist? Applying the sociological imagination to an analysis of Pebble would be very fruitful, and would help Alaskans move along in our journey towards making good decisions about Pebble. Thanks to http://sarahpalintruthsquad.files.wordpress.com/2008/10/pebble-mine-children.jpg for the pix.